We are always down for a challenge, especially one that involves watching lots of new horror movies. Do you keep a running list of movies you want to watch? We do. Rewritten about a thousand times, our “Movies to Watch” list exists in several scattered about journals and countless memos in our phones. Sadly, the moment comes. Years later, we’re avoiding spoilers for a movie that’s been out for nearly a decade. In an effort to finally cross some classics we’ve never seen off the list and expand our knowledge of the genre, we’re challenging ourselves to watch a new horror movie each day this May… starting with the letter ‘A’ and making our way through the alphabet. We’re taking our movie challenge to Instagram (Follow us on Instagram! ), and we hope you’ll join us by sharing your favorite horror movies for each letter of the alphabet. 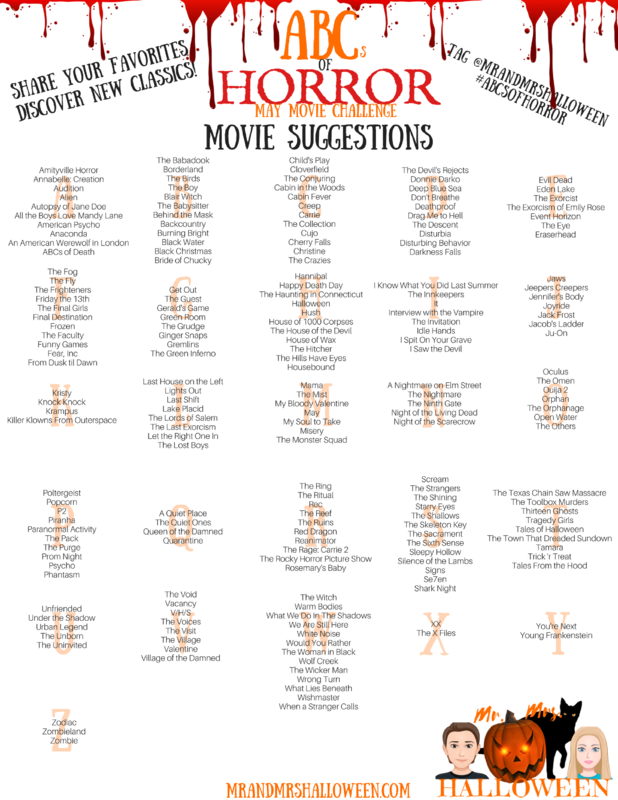 We need recommendations, and we hope it will inspire you to finally check off some horror movies from your movie list. Below are some goals we’re setting for ourselves. If you choose to join us, feel free to adjust in whatever way works best for you! Each day of May, starting on May 1st with the letter ‘A’ and ending on May 26th with the letter ‘Z’, we will make our way through the alphabet and watch a new horror movie we’ve never seen before. We’ll post our choices and thoughts along with some of our favorite titles starting with that day’s letter on Instagram every day. Follow us on Instagram, and let us know you’d like to join the challenge! You can choose to watch a new movie each day, share your favorite titles for that day’s letter, both, or whatever works best for you! Make sure to include #ABCsOfHorror and tag us @mrandmrshalloween so we see your choices! Print your FREE calendar and Movie Suggestions List to help you plan out your month! PRIZES will be awarded to random participants for playing along with us! We hope to see you on the ‘gram! Click here to PRINT your May Calendar and Movie Suggestions List!